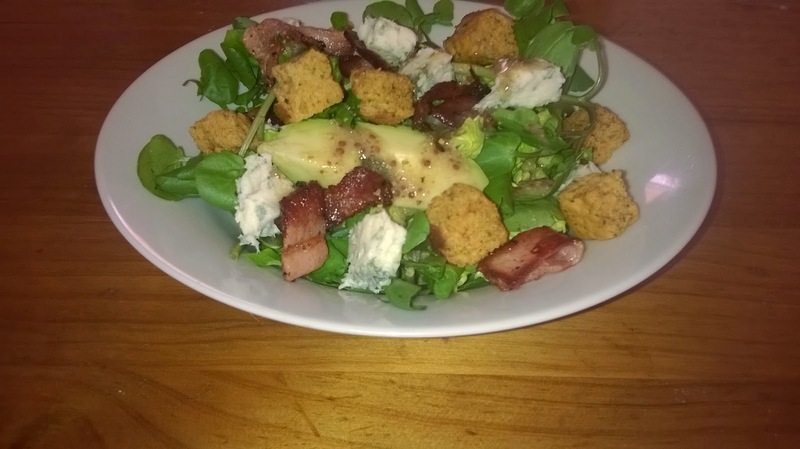 This is a salad which contains bacon and blue cheese – therefore, of course it is delicious. Apart from that, it also has avocado and watercress which I’m sure go some of the way to balance out the other ingredients. If you wanted to make this healthier, just omit the bacon and blue cheese and add some crisped onions instead. However, I think it’s lovely as it is. It’s a filling recipe for when it’s too warm to worry about cooking. This is very quick and the only item which needs any heat is the bacon; everything else just needs compiling. The recipe below will serve four. 1. Chop the bacon into thin strips and fry with one tablespoon of the olive oil over a high heat until the bacon is very crispy. Take off the heat and leave to one side. 2. Peel and slice the avocadoes and chop the lettuce. Put them in a large bowl with the watercress and pumpkin seeds – toss. 3. For the dressing, put the mustard, white wine vinegar and remaining oil in a small bowl and whisk together. 4. Slice the cheese into small 1cm cubes. 5. To serve, add a handful of the salad to a bowl and top with a sprinkling of bacon, croutons and cheese. Drizzle over the dressing.